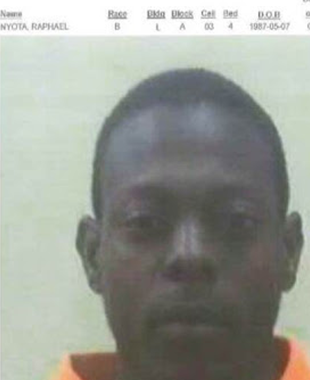 South African police have rearrested another Zimbabwean who recently escaped from Kutama Sinthumule Correctional Centre outside Makhado town in Limpopo Province. Raphael Nyota (30) had escaped from the prison where he was serving his sentence for robbery and murder with seven others. He was reportedly re-arrested in a pre-dawn raid in Ivory Park Gauteng on Friday morning. Limpopo police spokesperson Colonel Moatshe Ngoepe said the inmates escaped from prison on 27 October last year in the evening. He said other members of the gang who were arrested earlier last week are Chris Faku (37), Jabulani Isaac Mahlangu (32) from Pretoria in the Gauteng Province, Ntshengedzeni Manukha (26) from Thohoyandou, Ntshavheni Thomas Munyai (30) from Riverside, Justice Makamo (28) from Zimbabwe and Phathutshedzo Namadodzi (34) from Dididi village outside Thohoyandou. “The remaining escapee of the seven prisoners who broke out from Kutama Sinthumule Correctional Centre outside Makhado has been re-arrested during an Intelligence-led joint operation that was conducted in the early hours of Friday. “Raphael Nyota aged 30 from Harare in Zimbabwe, was apprehended around Ivory Park taxi rank in the Gauteng Province. This brings to seven (7) the total number of all the escapees re-arrested. Nyota was imprisoned for murder and robbery with aggravating circumstances,” he said. He said Nyota will soon appear before a Makhado Magistrate Court charged with escaping from lawful custody. “Investigations around the jail escape are underway,” said Col Ngoepe. The Provincial Police Commissioner for Limpopo Lieutenant General Nneke Ledwaba said, “I would like to commend the teams of Saps Operations and other role players for the job well done in bringing all these dangerous criminals back to where they belong”.